Mitchell 1 has completed model year 2018 updates to its labor estimating, diagnostic trouble code procedures and repair information for all makes of medium- and heavy-duty trucks. 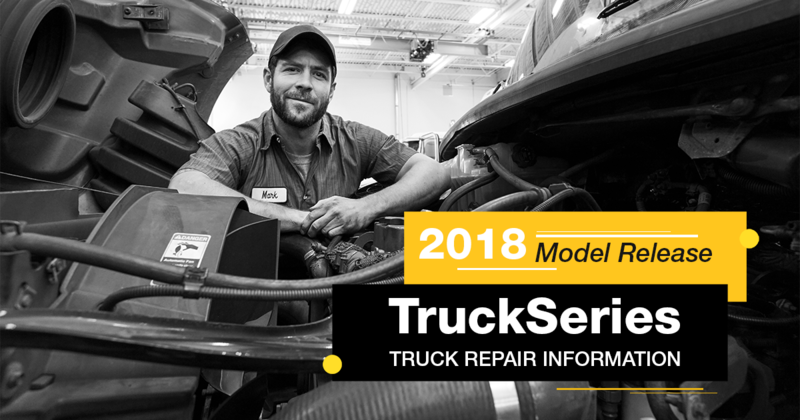 The TruckSeries truck repair software suite provides truck service technicians with fast, complete and accurate solutions for every stage of the repair process, in a single online application. Mitchell 1 keeps the software current throughout the year with ongoing updates and adds data for the latest model year vehicles for which repair information is available. Subscribers automatically receive the new information as it becomes available so they can be sure they have the most current maintenance and repair data to reference. Mitchell 1′s TruckSeries is the only comprehensive repair information software suite of its kind available for Class 4-8 trucks, delivering a one-stop, single log-in, all-makes data resource with scalable wiring diagrams, digital pictures, DTC-to-diagnostics, mechanical labor time estimating, and more, all delivered in seconds. TruckSeries is integrated with Manager™ SE Truck Edition, Mitchell 1’s award-winning truck shop management software that delivers an end-to-end solution for every step of the repair process.